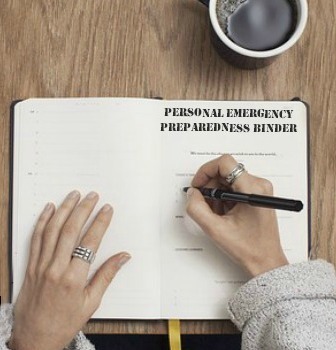 Few can deny the common sense behind preparing for something that is definitely going to happen, yet every year, an impending winter storm sends people rushing out to the store at the last minute, prepping for a blizzard that is due to hit in mere hours. Every winter, if you live in certain climates, blizzards are going to occur. Usually, at least one storm will hit that will cause you to be snowed in. Often, those storms mean you will also lose power. There is the inevitable rush to the store for milk and bread, during which people battle it out for the last supplies left on the shelves. But you can avoid all that. 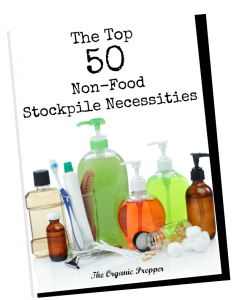 You don’t have to be a bunker-dwelling, MRE-chomping, camo-clad prepper to see the logic behind keeping some extra food and other supplies on hand for something that happens every single year. “I’ll just eat snow.” No, this is a horrible idea. First of all, snow is mostly air, and you’d have to eat 20 quarts of it to equal 2 quarts of water. Secondly, if you eat that much snow you will lower your core temperature and put yourself at risk for hypothermia. If you already don’t have water, you have enough problems. You don’t need hypothermia. For a small amount of money, you can have a 5-gallon jug of water sitting in your closet, instead of melting snow, crouched beside a fire in the backyard, watching the pot. You aren’t in the wilderness fending off bears. This really is not a good plan. First of all, the snow picks up all sorts of pollution as it falls through the atmosphere. The impurities can potentially make you sick. If you really get yourself in a poorly thought-out situation in which snow is your only hope for survival, boil it for 10 minutes before drinking it. Then, when the crisis is over, please store some water so you never have to do this again. You can create your water supply very inexpensively. Many people use clean 2-liter soda pop bottles to store tap water. Others fill the large 5-gallon jugs with filtered water from the grocery store. Consider a gravity fed water filtration device and water purification tablets as well. Other filtration options are the small personal filters like the Sawyer mini or the Berkey-to-go. Enough with the milk and bread already. Do you even consume milk and bread on a regular basis? This is really not the food you want to propel you through shoveling a driveway 17 times until the plow goes past, at which point you shovel it again. There are two schools of thought regarding food during a power outage. One: you need a cooking method that does not require the grid to be functioning. Two: you can store food that doesn’t require cooking. This is a good idea if you don’t have an emergency stove or wood heat. Freezing to death in your own home would be a terrible way to go, wouldn’t it? It’s pretty anticlimactic. There’s no grand story of adventure. You just basically didn’t have enough blankets and common sense to stay warm in a house. Don’t be that person. During the first 24 hours after a power outage, you can stay fairly warm if you block off one room of the house for everyone to group together in. Keep the door closed and keep a towel or blanket folded along the bottom of the door to conserve warmth. You can safely burn a couple of candles also, and in the enclosed space, your body heat will keep it relatively warm. As well, dress in layers and keep everything covered – wear a hat, gloves (fingerless ones allow you to still function), and a scarf. Consider a portable propane heater (and propane) or an oil heater. You have to be very careful what type of backup heat you plan on using, as many of them can cause carbon monoxide poisoning if used in a poorly ventilated area. If you plan to use off-grid heat methods, pick up a carbon monoxide alarm with a battery back-up. The gas has no smell, and often people who die from inhaling it simply drift off to sleep, never to awaken. A common cause of illness, and even death, during a down-grid scenario is the lack of sanitation. We’ve discussed the importance of clean drinking water, but you won’t want to use your drinking water to keep things clean or to flush the toilet. If the pipes are frozen or you have no running water for other reasons during a winter storm, you’ll need to consider sanitation needs. For cleaning, reduce your need to wash things. Stock up on paper plates, paper towels, and disposable cups and flatware. Keep some disinfecting cleaning wipes and sprays (I don’t recommend using antibacterial products on a regular basis, however in the event of an emergency they can help to keep you healthy.) Use hand sanitizer after using the bathroom and before handling food or beverages – there may be a lot more germs afoot in a disaster. Look at your options for bathroom sanitation. Does your toilet still flush when the electricity is out? Many people discovered the hard way that the toilets didn’t work when the sewage backed up in the highrises in New York City in the aftermath of Hurricane Sandy. At our old cabin, the toilet wouldn’t flush without power because the pump was electric. Candles are the first things that most people think of in the event of an emergency. While they can be a great solution, they do increase the risk of house fires. Be sure to use them safely and keep them away from children and pets. Some basic items will make your life much easier during an emergency. The good thing is, most folks already have the supplies on the “bare minimum” list. All you need to do is collect them and put them in one easily accessible container. You probably won’t need a field trauma kit that allows you to amputate limbs or remove a bullet, but you definitely want to have a few things on hand. It’s important to have a basic first aid kit on hand at all times, but particularly in the event of an emergency. Your kit should include basic wound care items and over-the-counter medications. Don’t feel like you are crossing over to the tinfoil hat side by preparing for all eventualities during a winter storm. This doesn’t mean you’re loading up on gas masks and decontamination suits. It doesn’t mean your house is stacked to the rafters with ammo and body armor. It’s just plain old-fashioned common sense to keep a naturally occurring event from becoming a crisis.